Dapsone-USP, 4,4'-diaminodiphenylsulfone (DDS), is a primary treatment for Dermatitis herpetiformis. It is an antibacterial drug for susceptible cases of leprosy. It is a white, odorless crystalline powder, practically in-soluble in water and insoluble in fixed and vegetable oils. Inactive Ingredients: Colloidal silicone dioxide, magnesium stearate, microcrystalline cellulose and corn starch. Actions: The mechanism of action in Dermatitis herpetiformis has not been established. By the kinetic method in mice, Dapsone is bactericidal as well as bacteriostatic against Mycobacterium leprae. Absorption and Excretion: Dapsone, when given orally, is rapidly and almost completely absorbed. About 85 percent of the daily intake is recoverable from the urine mainly in the form of water-soluble metabolites. Excretion of the drug is slow and a constant blood level can be maintained with the usual dosage. Blood Levels: Detected a few minutes after ingestion, the drug reaches peak concentration in 4-8 hours. Daily administration for at least eight days is necessary to achieve a plateau level. With doses of 200 mg daily, this level averaged 2.3 Î¼g/ml with a range of 0.1-7.0 Î¼g/ml. The half-life in the plasma in different individuals varies from ten hours to fifty hours and averages twenty-eight hours. Repeat tests in the same individual are constant. Daily administration (50 - 100 mg) in leprosy patients will provide blood levels in excess of the usual minimum inhibitory concentration even for patients with a short Dapsone half-life. The patient should be warned to respond to the presence of clinical signs such as sore throat, fever, pallor, purpura or jaundice. Deaths associated with the administration of Dapsone have been reported from agranulocytosis, aplastic anemia and other blood dyscrasias. Complete blood counts should be done frequently in patients receiving Dapsone. The FDA Dermatology Advisory Committee recommended that, when feasible, counts should be done weekly for the first month, monthly for six months and semi-annually thereafter. If a significant reduction in leucocytes, platelets or hemopoiesis is noted, Dapsone should be discontinued and the patient followed intensively. Folic acid antagonists have similar effects and may increase the incidence of hematologic reactions; if co-administered with Dapsone the patient should be monitored more frequently. Patients on weekly pyrimethamine and Dapsone have developed agranulocytosis during the second and third month of therapy. General: Hemolysis and Heinz body formation may be exaggerated in individuals with a glucose-6-phosphate dehydrogenase (G6PD) deficiency, or methemoglobin reductase deficiency, or hemoglobin M. This reaction is frequently dose-related. Dapsone should be given with caution to these patients or if the patient is exposed to other agents or conditions such as infection or diabetic ketosis capable of producing hemolysis. Drugs or chemicals which have produced significant hemolysis in G6PD or methemoglobin reductase deficient patients include Dapsone, sulfanilamide, nitrite, aniline, phenylhydrazine, napthalene, niridazole, nitro-furantoin and 8-amino-antimalarials such as primaquine. Drug Interactions: Rifampin lowers Dapsone levels 7 to 10-fold by accelerating plasma clearance; in leprosy this reduction has not required a change in dosage. Folic acid antagonists such as pyrimethamine may increase the likelihood of hematologic reactions. A modest interaction has been reported for patients receiving 100 mg Dapsone daily in combination with trimethoprim 5 mg/kg q6h. On Day 7, the serum Dapsone levels averaged 2.1 ± 1.0 Î¼g/mL in comparison to 1.5 ± 0.5 Î¼g/mL for Dapsone alone. On Day 7, trimethoprim levels averaged 18.4 ± 5.2 Î¼g/mL in comparison to 12.4 ± 4.5 Î¼g/mL for patients not receiving Dapsone. Thus, there is a mutual interaction between Dapsone and trimethoprim in which each raises the level of the other about 1.5 times. A crossover study1 designed to assess the potential of a drug interaction between Dapsone, 100 mg/day and trimethoprim, 200 mg every 12 hours, in eight asymptomatic HIV positive volunteers (average CD4 count 524 cells/mm3) demonstrated that there was not a significant drug intreraction between Dapsone and trimethoprim. However, an earlier report2 also by Lee et al, in 78 HIV infected patients with acute Pneumocystis carinii pneumonia, receiving Dapsone, 100 mg/day and higher trimethoprim dose, 20 mg/kg/day, demonstrated that the serum levels of Dapsone were increased by 40% and trimethoprim levels were increased by 48% when the drugs were administered concurrently. Carcinogenesis, mutagenesis: Dapsone has been found carcinogenic (sarcomagenic) for male rats and female mice causing mesenchymal tumors in the spleen and peritoneum, and thyroid carcinoma in female rats. Dapsone is not mutagenic with or without microsomal activation in S. typhimurium tester strains 1535, 1537, 1538, 98, or 100. Pregnancy: Teratogenic Effects. Pregnancy Category C: Animal reproduction studies have not been conducted with Dapsone. Extensive, but uncontrolled experience and two published surveys on the use of Dapsone in pregnant women have not shown that Dapsone increases the risk of fetal abnormalities if administered during all trimesters of pregnancy or can affect reproduction capacity. Because of the lack of animal studies or controlled human experience, Dapsone should be given to a pregnant woman only if clearly needed. In general, for leprosy, USPHS at Carville recommends maintenance of Dapsone. Dapsone has been important for the management of some pregnant D.H. patients. Nursing Mothers: Dapsone is excreted in breast milk in substantial amounts. Hemolytic reactions can occur in neonates. See section on hemolysis. Because of the potential for tumorgenicity shown for Dapsone in animal studies a decision should be made whether to discontinue nursing or discontinue the drug taking into account the importance of drug to the mother. Pediatric Use: Pediatric patients are treated on the same schedule as adults but with correspondingly smaller doses. Dapsone is generally not considered to have an effect on the later growth, development and functional development of the pediatric patient. Hematologic Effects: Dose-related hemolysis is the most common adverse effect and is seen in patients with or without G6PD deficiency. Almost all patients demonstrate the inter-related changes of a loss of 1-2g of hemoglobin, an increase in the reticulocytes (2-12%), a shortened red cell life span and a rise in methemoglobin. G6PD deficient patients have greater responses. Nervous System Effects: Peripheral neuropathy is a definite but unusual complication of Dapsone therapy in non-leprosy patients. Motor loss is predominant. If muscle weakness appears, Dapsone should be withdrawn. Recovery on withdrawal is usually substantially complete. The mechanism of recovery is reported by axonal regeneration. Some recovered patients have tolerated retreatment at reduced dosage. In leprosy this complication may be difficult to distinguish from a leprosy reactional state. Body As A Whole: In addition to the warnings and adverse effects reported above, additional adverse reactions include: nausea, vomiting, abdominal pains, pancreatitis, vertigo, blurred vision, tinnitus, insomnia, fever, headache, psychosis, phototoxicity, pulmonary eosinophilia, tachycardia, albuminuria, the nephrotic syndrome, hypoalbuminemia without proteinuria, renal papillary necrosis, male infertility, drug-induced Lupus erythematosus and an infectious mononucleosis-like syndrome. In general, with the exception of the complications of severe anoxia from overdosage (retinal and optic nerve damage, etc.) these adverse reactions have regressed off drug. Nausea, vomiting, hyperexcitability can appear a few minutes up to 24 hours after ingestion of an overdosage. Methemoglobin induced depression, convulsions or severe cyanosis requires prompt treatment. In normal and methemoglobin reductase deficient patients, methylene blue, 1-2 mg/kg of body weight, given slowly intravenously, is the treatment of choice. The effect is complete in 30 minutes, but may have to be repeated if methemoglobin reaccumulates. For non-emergencies, if treatment is needed, methylene blue may be given orally in doses of 3-5 mg/kg every 4-6 hours. Methylene blue reduction depends on G6PD and should not be given to fully expressed G6PD deficient patients. Dermatitis herpetiformis: The dosage should be individually titrated starting in adults with 50 mg daily and correspondingly smaller doses in children. If full control is not achieved within the range of 50-300 mg daily, higher doses may be tried. Dosage should be reduced to a minimum maintenance level as soon as possible. In responsive patients there is a prompt reduction in pruritus followed by clearance of skin lesions. There is no effect on the gastrointestinal component of the disease. Dapsone levels are influenced by acetylation rates. Patients with high acetylation rates, or who are receiving treatment affecting acetylation may require an adjustment in dosage. A strict gluten free diet is an option for the patient to elect, permitting many to reduce or eliminate the need for Dapsone; the average time for dosage reduction is 8 months with a range of 4 months to 2 1/2 years and for dosage elimination 29 months with a range of 6 months to 9 years. Leprosy: In order to reduce secondary Dapsone resistance, the WHO Expert Committee on Leprosy and the USPHS at Carville, LA, recommended that Dapsone should be commenced in combination with one or more anti-leprosy drugs. In the multidrug program Dapsone should be maintained at the full dosage of 100 mg daily without interruption (with corresponding smaller doses for children) and provided to all patients who have sensitive organisms with new or recrudescent disease or who have not yet completed a two year course of Dapsone monotherapy. For advice and other drugs, the USPHS at Carville, LA (1-800-642-2477) should be contacted. Before using other drugs consult appropriate product labeling. In lepromatous and borderline lepromatous patients, the recommendation is the co-administration of Dapsone 100 mg daily with two years of Rifampin 600 mg daily. Under WHO daily Rifampin may be replaced by 600 mg Rifampin monthly, if supervised. One may elect the concurrent administration of a third anti-leprosy drug, usually either Clofazamine 50-100 mg daily or Ethionamide 250-500 mg daily. Dapsone 100 mg daily is continued 3-10 years until all signs of clinical activity are controlled with skin scrapings and biopsies negative for one year. Dapsone should then be continued for an additional 10 years for borderline patients and for life for lepromatous patients. Secondary Dapsone resistance should be suspected whenever a lepromatous or borderline lepromatous patient receiving Dapsone treatment relapses clinically and bacteriologically, solid staining bacilli being found in the smears taken from the new active lesions. If such cases show no response to regular and supervised Dapsone therapy within three to six months or good compliance for the past 3-6 months can be assured, Dapsone resistance should be considered confirmed clinically. Determination of drug sensitivity using the mouse footpad method is recommended and, after prior arrangement, is available without charge from the USPHS, Carville, LA. Patients with proven Dapsone resistance should be treated with other drugs. Abrupt changes in clinical activity occur in leprosy with any effective treatment and are known as reactional states. The majority can be classified into two groups. The â€œReversalâ€ reaction (Type 1) may occur in borderline or tuberculoid leprosy patients often soon after chemotherapy is started. The mechanism is presumed to result from a reduction in the antigenic load: the patient is able to mount an enhanced delayed hypersensitivity response to residual infection leading to swelling (â€œReversalâ€) of existing skin and nerve lesions. If severe, or if neuritis is present, large doses of steroids should always be used. If severe, the patient should be hospitalized. In general anti-leprosy treatment is continued and therapy to suppress the reaction is indicated such as analgesics, steroids, or surgical decompression of swollen nerve trunks. USPHS at Carville, LA should be contacted for advice in management. Erythema nodosum leprosum (ENL) (lepromatous reaction) (Type 2 reaction) occurs mainly in lepromatous patients and small numbers of borderline patients. Approximately 50% of treated patients show this reaction in the first year. The principal clinical features are fever and tender erythematous skin nodules sometimes associated with malaise, neuritis, orchitis, albuminuria, joint swelling, iritis, epistaxis or depression. Skin lesions can become pustular and/or ulcerate. Histologically there is a vasculitis with an intense polymorphonuclear infiltrate. Elevated circulating immune complexes are considered to be the mechanism of reaction. If severe, patients should be hospitalized. In general, anti-leprosy treatment is continued. Analgesics, steroids, and other agents available from USPHS, Carville, LA, are used to suppress the reaction. Dapsone Tablets USP, 25 mg are available as round white scored tablets, debossed â€œ25â€ above and â€œ102â€ below the score and on the obverse â€œJACOBUSâ€ in a Unit of Use carton of 30 tablets (2 x 15). The blisters are light and child-resistant. NDC 49938-102-30. Dapsone Tablets USP, 100 mg are available as round white scored tablets, debossed â€œ100â€ above and â€œ101â€ below the score and on the obverse â€œJACOBUSâ€ in a Unit of Use carton of 30 tablets (2 x 15).The blisters are light and child-resistant. NDC 49938-101-30. 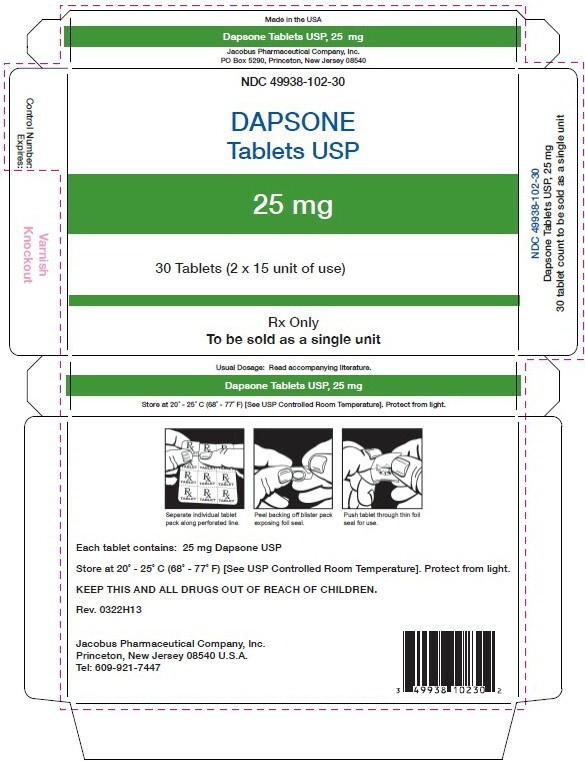 Dapsone Tablets USP, 25 mg are available as round white scored tablets, debossed â€œ25â€ above and â€œ102â€ below the score and on the obverse â€œJACOBUSâ€ in a Unit of Use carton of 28 tablets (2 x 14). The blisters are light and child-resistant. NDC 49938-102-28. 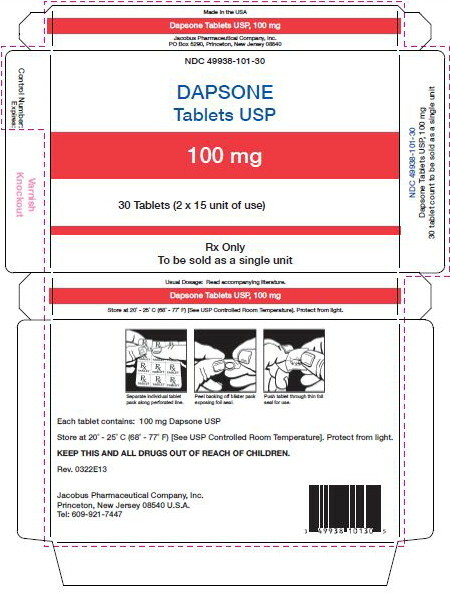 Dapsone Tablets USP, 100 mg are available as round white scored tablets, debossedâ€œ100" above and â€œ101â€ below the score and on the obverse â€œJACOBUSâ€ in a Unit of Use carton of 28 tablets (2 x 14). The blisters are light and child-resistant. NDC 49938-101-28. Lee, B., et al., Zidovudine, Trimethoprim, and Dapsone Pharmacokinetic Interactions in Patients with HIV Infection. Antimicrobial Agents and Chemotherapy, May 1996; 1231-1236. Lee, B., et al., Dapsone, Trimethoprim, and Sulfamethoxazole Plasma Levels During Treatment of Pneumocystis Carinii Pneumonia in Patients with AIDS, Annals of Internal Medicine, 1989; 110:606-611. Store at 20°- 25° C (68°- 77°F). [see USP Controlled Room Temperature]. Protect from light. Rx only. Keep this and all medication out of the reach of children.